William Harrison was the 9th President of the United States of America, the symbolic leader of the country. His term in office, his presidency, only lasted for 32 days during the year of 1841. He was 68 years old when he entered office on March 4, 1841. William Henry Harrison was the grandfather of Benjamin Harrison who became the 23rd US President. He was often referred to as 'Bill' by his family and friends. He had a variety of nicknames including Old Tippecanoe, The Cincinnatus of the West, Old Granny, General Mum and Washington of the West. The reference to Tippecanoe and Washington of the West were his victories at the 1811 Battle of Tippecanoe and 1813 Battle of the Thames. General Mum was due to his avoidance of speaking out on controversial issues. The picture of William Harrison portrays an interesting image of what this famous man looked like. The picture shows the clothing and the hairstyle that was fashionable during his presidency. He is described as being 5 feet 8 inches in height and 140 pounds in weight. He had brown eyes and thin, wispy brown hair that went gray with age and a light complexion. His heavy eyebrows and prominent nose dominated his angular features. His tight, thin lips were in contrast to his strong jaw. 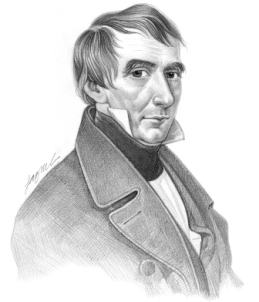 Character and Personality Traits: What was William Harrison like? The personality of William Harrison is described as being genial, kind and good humored, at odds with his somewhat stern appearance. He was frank, direct and humble, without airs and graces. He was also a cautious man whose nickname "General Mum" reflected his caution and his avoidance of speaking out on controversial issues. The important role and duties of the President of the United States of America include those of Chief of State, Chief Diplomat, Chief Executive, Commander in Chief, Legislative Leader and Leader of his own political party. What was William famous for? Why was he important? The history and life of President William Harrison during his presidency is conveyed in the following fact file in an easy question and answer format. What President was William Harrison? What other political offices did William Harrison hold before his presidency? Who was William Harrison' s first lady? William Harrison was famous for the events and accomplishments of his presidency, but what are the facts about the man and his private life. Facts and information about the private life of William Harrison can be found in the following fact file in an easy question and answer format. When and where was William Harrison born? Where was William Harrison educated and what was his religion? What did William Harrison do before he became President of the United States? Who was William Harrison' wife and when did they marry? Did they have kids? When did William Harrison die? He died on April 4, 1841, in Washington, D.C.
We hope that the picture, facts and information on President William Harrison will prove helpful to kids, school children and schools learning about the presidency of this famous American leader. The facts about William Harrison provides an overview of the President's character and personality traits. Watch the video and learn more about the major events of his life and his accomplishments. The following William Harrison video is a useful educational resource for kids, children and schools learning about the life of the US President William Harrison.